Homecoming at Ray High School will be Friday, Sept. 14. 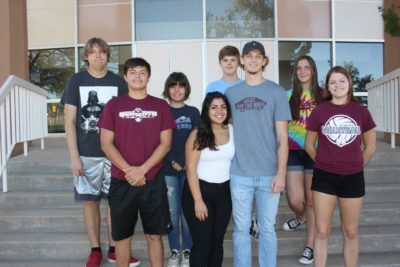 Ray High School’s Royal Court for 2018 are, from left: Parker Towne (Freshman), Jayden Lagunas (Junior), Ashiya Varley (Freshman), Danielle Hinojos (Queen), John Warren (Sophomore), Stone Patterson (King), Emma Stuart (Sophomore) and Shelby Yocum (Junior). Festivities begin Friday with the traditional parade. The Ray football team improved to 3 – 1 following last Friday’s 64 – 12 victory at NFL Yet Academy. The win was the Cats’ second-straight one-sided victory on the road. Ray rushed for six touchdowns, passed for one, returned a punt for another, and returned a blocked punt for a touchdown. The Cats have outscored their last two opponents, 136 – 12. “I think the biggest reason is the team has a good grasp on coach Lechuga’s new offense,” answered Fessenden when asked what’s the biggest reason for the success during the last two games. “They’re more comfortable and confident, and it has shown. Up next: Ray will return home to host El Capitan on Homecoming this Friday. Kickoff is scheduled for 7 p.m.